WAYNE COUNTY, N.C. (WTVD) -- UPDATE: These donation centers are no longer taking donations. Storm damage and flooding have created an immediate need of assistance for many of our neighbors. 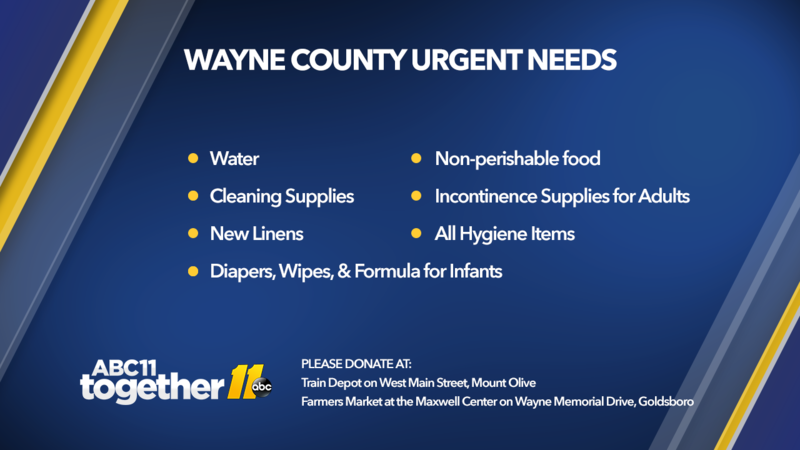 If you are in Wayne County and would like to donate items for victims of Hurricane Florence, you can take them to the Train Depot on West Main Street in Mt. Olive and the Farmers Market at the Maxwell Center on Wayne Memorial Drive in Goldsboro from 9:00 a.m. - 4:00 p.m. beginning Monday, Sept. 17. Clothing cannot be accepted at these locations and should be taken to the Salvation Army in Goldsboro.